NESTLED IN THE HEART OF SOUTHWEST SASKATCHEWAN, IN THE NEWLY ACCLAIMED DOWNTOWN HERITAGE DISTRICT OF MAPLE CREEK, YOU WILL FIND BRASHTONES CUSTOM TATTOO & PIERCING PARLOUR. 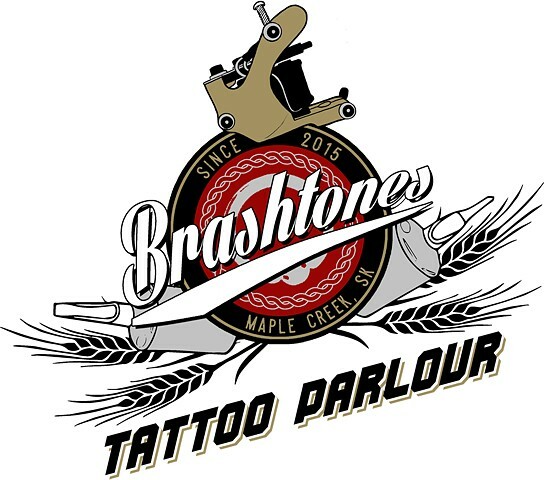 ESTABLISHED IN JULY 2015, BRASHTONES IS PROUD TO HOLD TITLE AS MAPLE CREEK’S FIRST AND ONLY TATTOO & PIERCING PARLOUR. IT IS OWNED AND OPERATED BY HUSBAND AND WIFE DUO, SEAN AND KALEE BARNARD. IN 2008, SEAN BEGAN HIS CAREER AS A TATTOO ARTIST IN VANCOUVER, ONE OF CANADA’S MOST ETHNICALLY DIVERSE CITIES. AS YEARS PASSED, SEAN WAS PRESENTED THE OPPORTUNITY TO MOVE TO MEDICINE HAT, ALBERTA TO EXPAND HIS CAREER AS A TATTOO ARTIST. IT WAS HERE THAT SEAN MET HIS WIFE, KALEE AND IN 2015 THEY MADE THE DECISION TO MOVE THEIR FAMILY TO THE PRAIRIES OF SOUTHWEST SASKATCHEWAN WHERE KALEE HAD ORIGINATED FROM. MAPLE CREEK IS A TOWN THEY ARE ARE PROUD TO CALL HOME AND A WONDERFUL PLACE TO RAISE THERE 4 CHILDREN. IT IS CONVENIENTLY LOCATED 8 KM SOUTH OF HWY 1, MIDWAY BETWEEN MEDICINE HAT, ALBERTA AND SWIFT CURRENT, SASKATCHEWAN AND CLOSE TO SEVERAL OF SASKATCHEWAN'S MOST UNIQUE ATTRACTIONS. BRASHTONES IS DRIVEN BY THE IDEAL OF INDIVIDUALITY AND CREATIVE EXCELLENCE, TAKING PRIDE IN A FRIENDLY, WELCOMING ATMOSPHERE, ITS CRAFTSMANSHIP, AND PROFESSIONALISM. THEY BELIEVE IN VIEWING THE BODY AS A WHOLE AND CREATING HARMONIOUS DESIGNS TO FLOW SEAMLESSLY WITH THE SKIN. ALL WORK IS UNIQUE TO THE INDIVIDUAL AND WILL WORK WITH CLIENTS UNTIL THEY ARE MORE THAN SATISFIED WITH THEIR DESIGNS BEFORE PROCEEDING. BRASHTONES CARES ABOUT ITS CLIENTS AND MAKES INFECTION CONTROL ITS NUMBER ONE PRIORITY! THEY STRIVE FOR REGULAR INSPECTION BY THE SASKATCHEWAN HEALTH AUTHORITY TO ENSURE COMPLIANCE WITH THE HEALTH HAZARD REGULATIONS AND THE SASKATCHEWAN PERSONAL SERVICE FACILITY BEST MANAGEMENT PRACTICES UNDER THE PUBLIC HEALTH ACT, 1994.